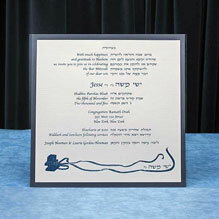 Here again you will find an incredible selection of designer Hebrew English Bar Mitzvah invitations at budget pricing. In the digital world we can create with color and backgrounds and feel free to express our imagination. Use one of our designs or share one of your own. 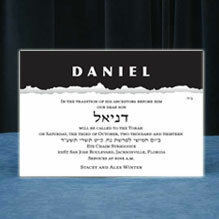 When reaching the exciting milestone of looking for Hebrew English Bar Mitzvah invitations, this is where you will find the incredible combination of a meaningful, elegant and low priced invitation. 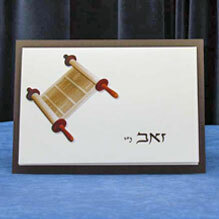 One of our more popular Hebrew English Bar Mitzvah invitations is the square design. As you scroll through I many different styles you will see many creative ways to incorporate you personal style into our various designs. 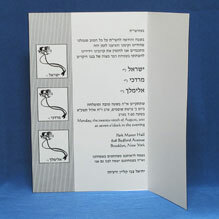 When looking to keep the dollar amount down on your Hebrew English Bar Mitzvah invitations consider this section of Budget folders, as well as it's twin pricing section of Economy Smart Cards. You'll be amazed at the beautiful designs available here. Many more ideas are in-house for your twins or triplets. 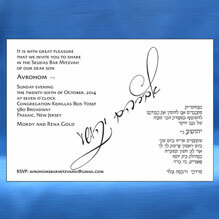 Let us create something unique for you for this truly unique occasion! Print it Flat and Save! 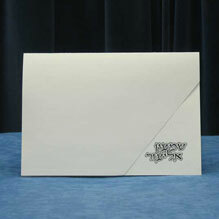 Upon our customers request we added a line of flat printed invitations. 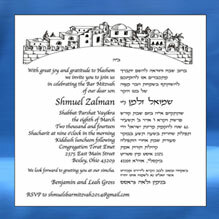 Enjoy the same trendy or conservative layouts, as well as quality printing, at the lower price of flat printed invitations.